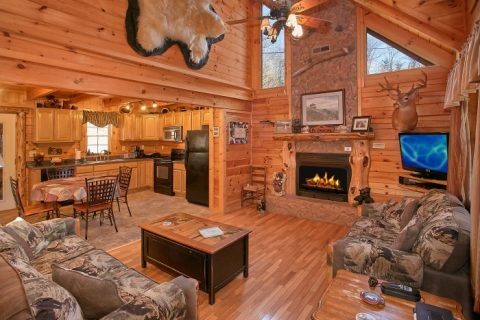 Searching for a Gatlinburg cabin with a prime location close to all the sights you want to see? 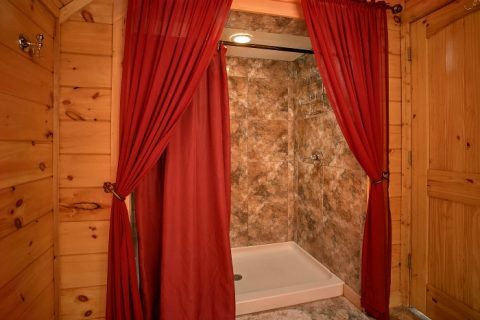 Look no further than "Beary Dashing," a 2-bedroom log cabin complete with comfortable amenities and our special online discount! 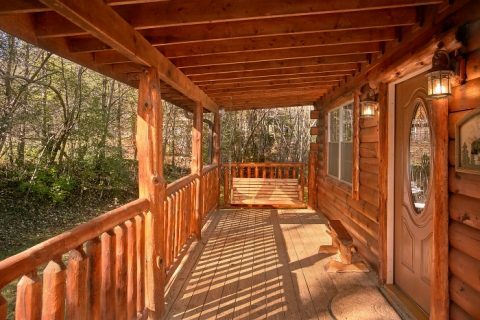 This cozy cabin for a small family is located near the Gatlinburg Welcome Center, the gateway to Downtown Gatlinburg along the Spur road. 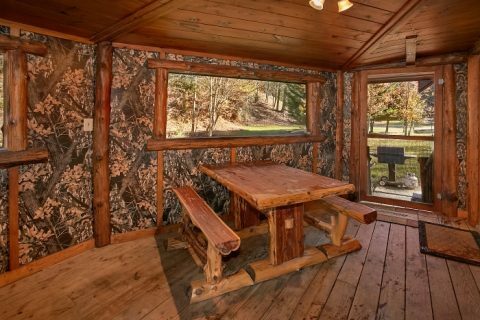 As a result, this cabin is extremely close to Downtown Gatlinburg. From here, guests can easily reach Ripley's Aquarium of the Smokies, the Gatlinburg Space Needle, or several entrances to the Great Smoky Mountains National Park. Additionally, the fun-filled Pigeon Forge Parkway is only a short drive away on scenic roadways. 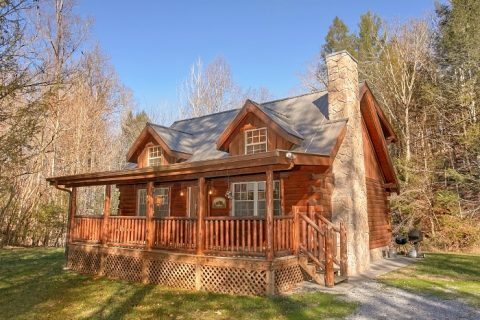 When you aren't busy enjoying the best things to do in the Smokies, you'll love unwinding at this cozy cabin with great features. In the living area, you can stay cozy with this cabin's lovely gas fireplace complete with stacked-stone and custom woodwork. This room also provides comfortable furnishings, a sleeper sofa, and a flat-screen television for watching your favorite movies and shows on vacation. 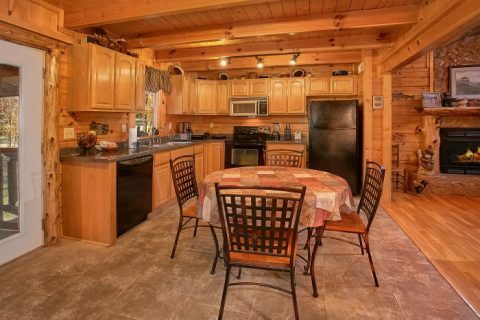 This cabin's full kitchen area and barbecue grill make it easy to keep your vacation budget on track because you won't have to go into town for all your meals. Outside on your cabin's screened-in, back deck, you can enjoy sitting out in the fresh mountain air without being troubled by insects. 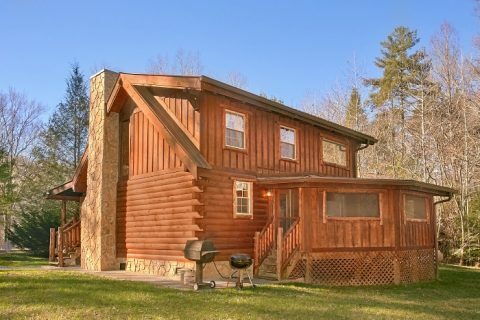 Additionally, this rental's flat yard area provides a nice space for the kids to play and get some exercise and offers a fire pit for chilly mountain nights. 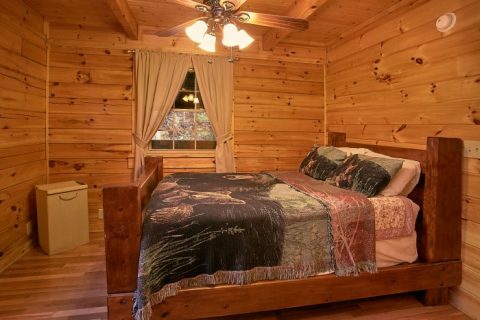 Once you're ready to get some rest, you'll love retiring to one of this cabin's two private bedrooms. 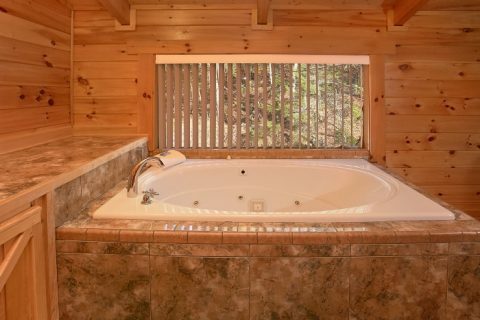 The main floor features a bedroom with a full bed, while the upstairs master suite comes complete with a king bed, private jacuzzi, and shower area with beautiful stone tiles. 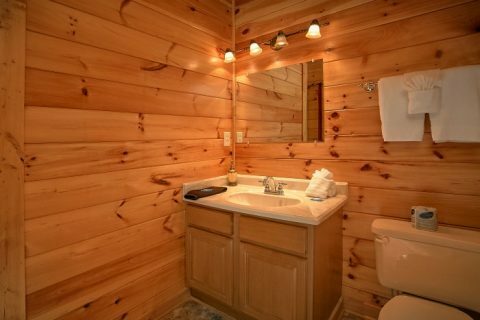 Some practical amenities included with this log cabin are a washer/dryer, WiFi, and a flat parking area for cars. Book "Beary Dashing" online today with Cabins USA Gatlinburg to save 15% off of your nightly rate today! 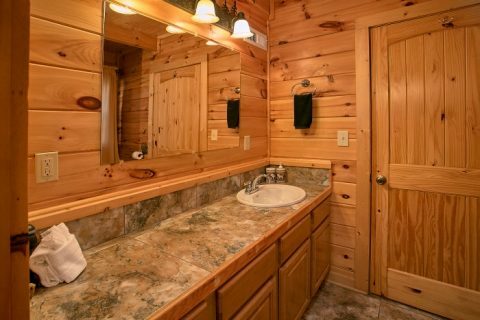 Check this cabin's availability and see how much you can save on your vacation in Gatlinburg, TN!